Preheat oven to 400 degrees F. Unroll crescent dough. Cut each segment into three equal sized parts. Place a generous pinch of the cheese over the dough. Top with a spoon full of diced ham. 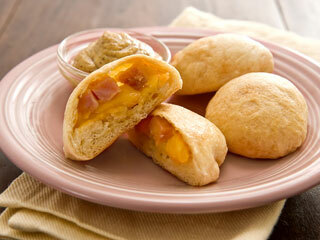 Wrap dough around the ham and cheese, pinching and positioning to completely cover. Place on a parchment-paper lined sheet tray with seam side down. Bake for 10-12 minutes or until the dough is golden brown. Serve with your favorite honey mustard for dipping. Serves 24.